Atmospheric aerosols contain numerous species including sulfates, nitrates, and organics. A very significant mass fraction (20–90%) of the submicron aerosol component is composed of, or contains, organic molecules. The challenges in their characterization lie in part in their enormous variety and complexity, as well as their fragility under analysis. Aerosol mass spectrometry has emerged as an extremely powerful technique for investigating organic and inorganic particles in both the field and the laboratory. Although the majority of aerosol mass spectrometers employ either a linear quadrupole or TOF-MS, ion trap mass spectrometers have been successfully used for single particle analysis. The ion trap offers a multitude of desirable properties: versatility, compact size, high duty cycle, high sensitivity, full spectrum collection for single particles, large accessible mass range, and tandem mass spectrometry capabilities for further speciation. The research teams of Profs. Michael Blades and John Hepburn were also involved in designing and building a new single particle aerosol mass spectrometer at UBC Chemistry to address some of these challenges. It is currently being operated as part of the LASIR facility. It combines high sensitivity (single particle detection capability, detection limit of ~200 nm) with a soft desorption/soft ionization scheme (tunable pulsed IR/tunable pulsed VUV) to minimize fragmentation of analyte species during the analysis process. By using and ion trap for mass detection, further structural information can be gained from tandem mass spectrometry. The single particle aerosol mass spectrometer that we recently developed incorporates VUV ionization and an ion trap for mass analysis. We have incorporated a new, high-powered, fully tunable VUV source (6.5–11 eV ionization energy). To generate VUV, UV light from a dye laser and visible or IR light from an OPO is focused into a rare gas cell. The UV and visible/IR light are separated from the generated VUV by an off-axis MgF2 lens and blocked by a ceramic beam dump. 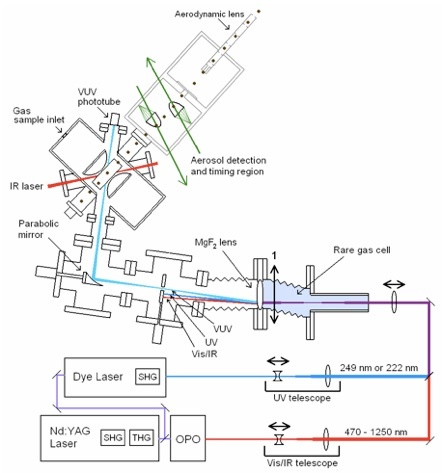 The VUV light is refocused into the center of an ion trap mass spectrometer by a parabolic mirror. Aerosols are focused into a collimated stream by an aerodynamic lens and detected by scattering from two 532 nm CW Nd:YAG lasers. When a particle reaches the center of the ion trap a CO2 laser is fired to vaporize it, followed by single photon ionization. The instrument can also be operated as a single particle ion trap mass spectrometer (SPIT-MS) for laser desorption and electron impact ionization. 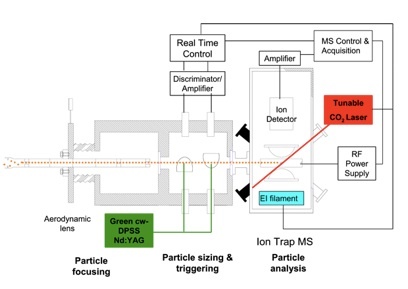 A sequence of MS/MS studies was performed for ions from caffeine aerosols using the 30 mJ setting from the CO2 laser and a 1 µs ionization delay. 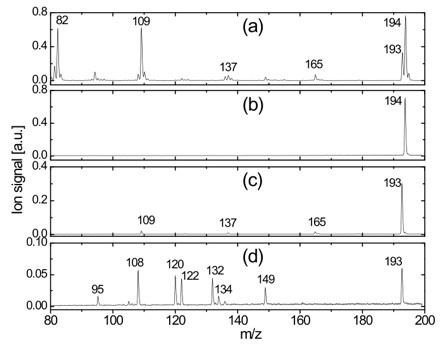 This diagram shows ion signal traces for: (a) the caffeine aerosol MS, (b) the isolation of parent peak (m/z 194), (c) the fragmentation of parent peak via collisional induced dissociation, and (d) the subsequent fragmentation of m/z 193.